The tattooing of the scalp is not new. This technique has been attempted by tattoo artists for years and has been used by hair transplant surgeons in the past. 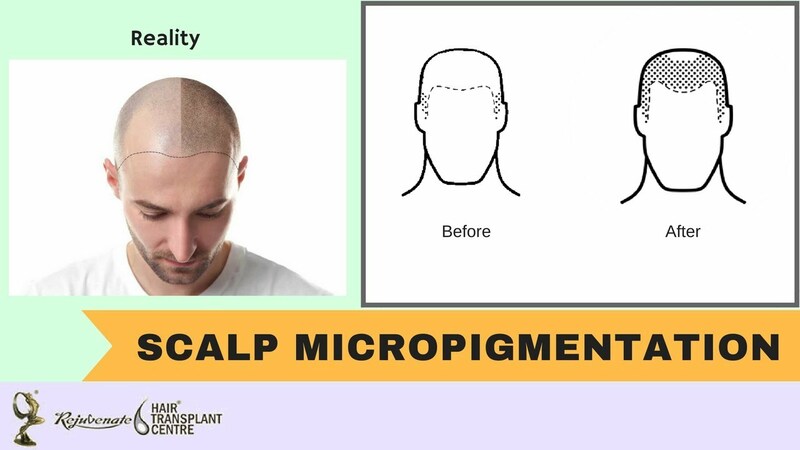 Scalp micro pigmentation (SMP) is a permanent cosmetic “tattoo” that mimics the short hairs of a closely shaved scalp. SMP offers a new treatment option for patients who are not hair transplant candidates and are willing to keep their hair very short or shave their scalp level. There are a few medical conditions that may have clear applicability to this procedure including patient with alopecia areata, alopecia totalis and a variety of scarring types of alopecia. SMP also offers excellent camouflage with a short hair style for patients who have old plugs, have had scalp reductions, or have scars from hair transplant surgeries that are disfiguring or not amenable to the individual’s styling needs. There is a segment of regular hair transplant patients who would like to cut their hair short but are limited due to hair transplant scars from various harvesting techniques. Also, there are patients who don’t want to have a transplant or aren’t good candidates like depleted donor areas, or hair transplant process that was never finished and for many reasons, can’t be finished. (e.g.Norwood grade V,VI,VII patients). The primary concern for SMP to potential patients is the potential change in the color of the pigment over time. There is also concern about the permanence of SMP. Like all tattoo and micro pigments, the color of SMP will likely fade to a lighter shade over time. Exposure to sun will accelerate changes in color as well. Bleeding of pigment from one spot to another is real problem and may be technique dependent. Too many procedures tend to lead to the bleeding of pigment into the depth of the skin. Finally, many SMP patients ask about the graying of their hair over time. This is an important issue that must be addressed before a patient undergoes SMP. SMP should be considered a permanent lifestyle changing process. Patients must accept that they need to keep their hair short, to an almost shaved appearance. If this primary concept is accepted, the graying of hair with age should not be an important issue as SMP is applied over the entire scalp thus blending in with ant grey stubble that may arise. In addition, the dying option for patients always remains. At the ISHRS meeting in Alaska, essentially every doctor had the opportunity to view a patient with Alopecia Totalis and no one reported that they could tell it was a tattoo. Clearly this is an art form as much as a technical process. Patients who had scalp micro-pigmentation are told not to go directly in the sun, and if they do, use a high SPF skin blocker. It is always best to use a hat for extended sun exposure. If there is frequent sun exposure without being protected, the color of the tattoo pigments may turn a slight green or blue color. For many, the concept of getting a tattoo on the scalp is foreign. Most patients, once they see the results, have a better understanding of the outcome (see scalpmicropigment.com). Thus, the consultations tend to be longer because it is not a mainstream approach to their balding problem.